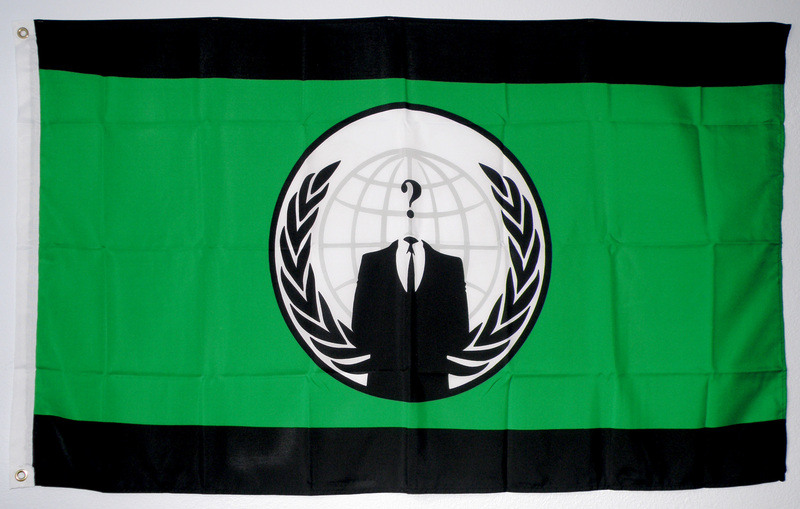 Way back over a year ago, I asked if there was anywhere I could get a Flag of Anonymous. Well, I finally have one. I bought it on eBay. Yes, this is the item I was talking about Sunday that I'd reveal. hotscubagreg2 from the US Virgin Islands was the seller. He's got tons of these flags. I've linked his name here to the items he's selling on eBay. He's legit, and a very fast shipper. The flag is your standard sized 3x5 foot flag. After I took the picture of the flag above, I tweaked the coloring a bit in the picture to show the true color of the flag. The camera didn't pick up the green color very true to life. Now all I need is a Guy Fawkes mask and a cult to protest. Exactly how many days dose it take to be shipped to you? @ Anonymous: It was faster than I'd expect from the US Virgin Islands to Alaska. I think it was 3 or 4 days. @ Anonymous (#3): Same thing, only mirror imaged. So the question mark looks backwards from the other side. SO you can guarantee on the seller's behalf that this is legit and worth the money? @ Anonymous (#5): The flag is made out of pretty thin material, so keep that in mind. But it is legit. How thin are we talking? too thin, or workable thin? @ Anonymous: I think if you were to put it out in the wind it would get tattered pretty quickly. But for hanging on your wall it's fine. It's not "transparent thin". I think it'd survive a few raids. Perhaps it could be reinforced with something, I look into it. Thank you for answering my questions, it's greatly appreciated. That's actually just what I've always wanted. Mostly to hang from my wall in honor of a great cause. For everything they do for the common good. Not everything they do is for the common good. Sometimes it's just for the lulz, and doesn't really benefit anyone beyond self amusement.